I hope you can forgive me that I'm not much of a sports fan. It's not that I don't appreciate the games or the excitement of competition, but rather I only have so many minutes in a day. I have often gently chided my bigfooting brethren who go out of their way to find out their favorite sports team's scores even while in the field. I write this off as another example of bigfooters' eccentricity, but that's the view of a sporting outsider. I am told this is much more common that I think. I recently stumbled across a sporty item that I hadn't seen before that is right up my alley. Over at Packer Palace, a football blog devoted to the Greenbay Packers, I stumbled across reference to the Legend of Packsquatch. What was I even doing on a football blog? This blog is run by the talented graphic artist and friend of the 'squatch, Scott McClean. 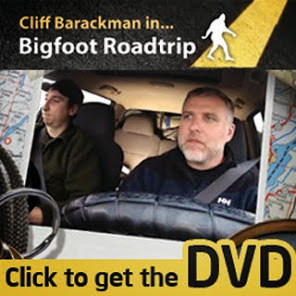 Scott lives in Los Angeles, and even though he is geographically cut off from the field for much of the year, he still has managed to make significant contributions to the world of bigfooting. One such way is that he has been compiling literally hundreds of historical accounts of bigfoot sightings from old newspapers dating back to the early 1800's. He has organized these into "Big News Prints," a state-by-state, chronological resource that is simply a "must have" for bigfooters like us. If you are a report junkie, this publication is for you. It is packed full of reports covering nearly two hundred years from all corners of the continent. If you are a historical bigfoot buff, this publication is for you. Scott has gone out of his way to gather much of the early "bigfoot" reports from Humboldt County from back in 1958. He has an impressive collection of articles that center on the Patterson/Gimlin Film from 1967.